Up around 8 or 8:30. Had breakfast, loaded the car, said good-bye. We were on the main highway by 10:20. We made very good time; no head winds today, so we could achieve a speed of 70 mph. Arrived in Lafayette about 12:45. Debby was in a good mood to meet her grandparents. We had lunch + visited. Paul + Marty arrived about 3. We had our gift exchange—more visiting. A slow afternoon; I became very tired—reclined on the bed for a few minutes before supper. Supper about 6:45. After supper we watched TV: “The Laugh-in.” Then Bonnie got the slides out, put them in the trays, and we showed all our slides. After this, Dad + Mother began heading for bed, so did John. Paul + Marty + Bonnie and I sat talking about the Gary experience. Too tired to bathe. Off to bed at about 12:40. A leisurely day. Up about 9. Sat around doing nothing much and visiting. John went home to Champaign in the morning. We have arranged to go over there this weekend. I called Mrs. Myers to tell her we’d be up on Saturday. We took a lot of pictures this morning of Paul + Marty + Debby + Bonnie + mother and myself. I called Gary Myers’  parents to get his address: South High Gardens, Apt. #12. Rural Route #4, Shelbyville, Ind. 46176. After lunch Paul, Marty and Bonnie + I played cards—we also had a chance earlier (in morning) to talk further about Gary schools. Supper was marred by an argument about the Israeli-Arab problem. Mom + Dad siding with Israel—the rest of us arguing for the Arab cause. After supper Marty + Paul left for home. The rest of the evening was spent watching TV. Bonnie sewed. Bathed; off to bed a few minutes after 12. Celebrated the New Year’s with ISN; lights out by 12:30. Got up around 9. Another wasted day. Didn’t do much of anything this morning. Mark, Shirley + family arrived about 11 AM. The kids are really wild; we ate about noon. Some attention was paid to the Rose Bowl Parade on TV. Floyd + Ruth + Steve arrived early in the afternoon. I found it a dull day. Tried to avoid Mark + Dad, since they inevitably get into arguments. – didn’t care to sit all afternoon watching football. Wrote letter to Gary Myers. Spent the afternoon chatting with Ruth, Shirley, Bonnie + Mom—took more pictures. About 5:30 we had supper and then all the visitors headed home. I napped briefly. Mom + Dad went to an open house. Bonnie worked more on my sports coat—I slummed=watched TV all evening. Called Bob Geiselman + Mrs. Myers to arrange Friday trip; bathed, off to bed at midnight. Another true “vacation” day; got up around 9—in the middle of the morning we all decided to go downtown to get the auto licenses for this year. We went downtown and did some shopping too; mailed letter to Gary Myers. I got some gloves at army surplus. We got home about 12. –I had carried Debby on my back. I napped in the afternoon, listened to records, read in Jenny Moore’s The People on Second Street. We had supper around 6. The listened to TV news + to Hal Holbrook’s Mark Twain Tonight. During this Levon King  called from Detroit inviting us to stop through there on our way back to Boston—which we shall do. Watched more TV, had a snack, then back to reading in Jenny Moore’s book; also started Marion Anderson’s autobiography. Up around nine. Put off breakfast to make it an early lunch. Read for a while in Mrs. Moore’s book. Had lunch, packed suitcase. Tried several times to get the car started—with no luck. Had to call tow-service to have the car started. Bonnie, Debby + I left for Kentland shortly after noon. About 1 we arrived at Mrs. Myers’ home. We had a nice visit until about 4 o’clock. We left town about 4:25. We headed west—toward Champaign. Strong headwinds—so we didn’t make good time. Arrived at John’s about 6:30—went over to Bob + Lea’s. Had supper there, visited during the evening; played password too late—had a very good time together. Finally off to bed at about 2:45—our time. In view of the time of retirement, I slept late; did awake when Bonnie fed Debby and got up herself, but was able to get some more sleep. Finally got up around 11 o’clock. Had juice for breakfast; shaved; at about 12 we all went over to John’s for lunch. Lea + Bob left—But Bonnie, Debby + I stayed with John for the afternoon. We relaxed, visited, listened to records; we came back over to Bob + Lea’s for supper. After supper, watched TV; Bob, John + Bonnie worked on a very difficult cross-word puzzle. Lea + I watched TV: movie starring Cary Grant: “Father Goose.” Lea had to leave for work about 10. Bob, John Bonnie + I visited until late; about 1 John left and we all went to bed. Lights out about 1:20. Again slept late. This was another day of relaxing and goofing off. Lea had worked the night shift last night, so she slept all morning. Bob + Bonnie + Debby + I went over to John’s for lunch. I read some in the afternoon in Mrs. Moore’s book—I did done in the forenoon also. Napped in the afternoon. About four we headed back over to Bob + Lea’s. Lea was up. We watched TV and visited. We then got ready and went to eat—went to a Chinese restaurant: the Tea Garden. We were home in time to see the Smothers Brothers. Turned TV off and spent the rest of the evening playing password. About 1 AM we decided to quit—and discovered that a howling snow-storm was going on. John got home alright, however. Off to bed about 2:15 (Eastern time). They lived in Gary, Indiana—or had at one time—and we had visited them there. My college roommate at Indiana University. He was the pastor who married us, along with I.U. Prof. Harold Hill. 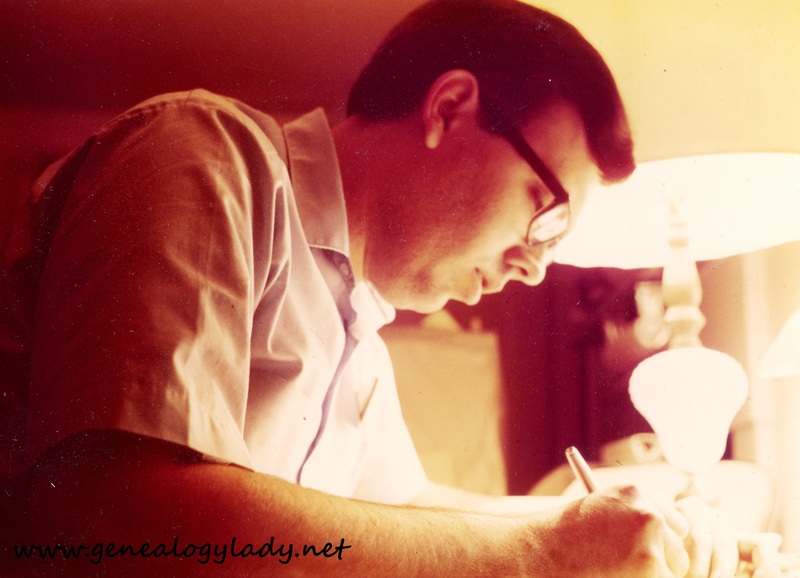 This entry was posted in Genealogy, Yegerlehner and tagged 1960s, David A. Yegerlehner, genealogy, Gladys R. (Foster) Yegerlehner, Indiana, John F. Yegerlehner, Lafayette, Lena "Lea" (Keith) Gieselman, Mark A. Yegerlehner, Robert Gieselman, Roscoe S. Yegerlehner, Ruth M. Myers on May 12, 2017 by Deborah Sweeney. “Then Bonnie got the slides out, put them in the trays, and we showed all our slides.” I’m surprised anybody ever invited us back! “also started Marion Anderson’s autobiography” I preached a sermon based on this book.